Editor’s note: In November, PRSA will celebrate PR Diversity Month by acknowledging the diverse communities, people and practices that encompass the public relations profession and by providing advice and insight on how to build a better PR industry though diversity. We’ve invited PR practitioners and thought leaders from around the country to offer their thoughts on various diversity topics affecting the PR industry. Track the series and join the discussion by using the hashtag #PRDiversity. For a full list of Diversity Month activities visit the 2014 Diversity Month section of the PRSA site. What normally comes to mind when I think of “diversity” in the workplace is gender, race, ethnicity and sexual orientation. What’s not normally thought of is the disabled professional – even as a person in a wheelchair myself, it’s not something that automatically comes to my mind. This is disappointing because although vastly underrepresented, physically disabled public relations professionals can be an asset to an agency. I’ve interviewed for jobs at PR firms all over the country in major cities including New York, San Diego, Los Angeles, Seattle, Washington DC, Dallas and Boston, where I currently reside. Throughout my travels, I have yet to meet another person with a physical disability in public relations, unless their job was to be a liaison between a city or corporation and the disabled public. They’re persistent – Like any minority, disabled people are used to hearing the word “no” way more than “yes” and yet it doesn’t stop them on the path to being successful. The first 30 reporters said no to an interview? No biggie, there’s still another 10 that might say yes – that’s their approach to just about everything. New ideas are brought to the table – Everyone has different life experiences that have potential to add value to an agency. Just like the coworker who switched careers on their journey to PR, a disabled coworker has a unique set of experiences that influence their approach to the job. They likely know alternative organizations to team up with or a media segment to target. They’re resourceful – I can’t tell you how many times I’ve needed something on a high shelf or had to figure out how to get in my car when someone’s parked too close. Since giving up is never an option, I’ve found tools in the most random of places, like using a hanger to open a cabinet. A physical disability forces a person to constantly be thinking outside the box on how an everyday item can be used to jump a hurdle. They can communicate through any situation – If a person has had a disability for longer than about 20 minutes, chances are they’ve been asked inappropriate questions or had to deal with rude comments. Those moments can be awkward, but teach a person how to graciously respond to people and tactfully decline to answer irrelevant questions. It’s an invaluable skill in PR that takes years to develop, but a disabled person already has in their back pocket. They’re good for public image – We’re in the business of public perception and having a diverse team makes an agency look good. It reflects the agency as an inclusive and open-minded environment, which is especially helpful when meeting with progressive potential clients. The one piece of advice I leave you with is to forget the person you’re working with has the disability. Yes, questions are allowed and it’s easier said than done, but at the end of the day we’re just like anyone else. We all want to be judged based on an ethical, enthusiastic approach to PR, giving clients top-notch results. 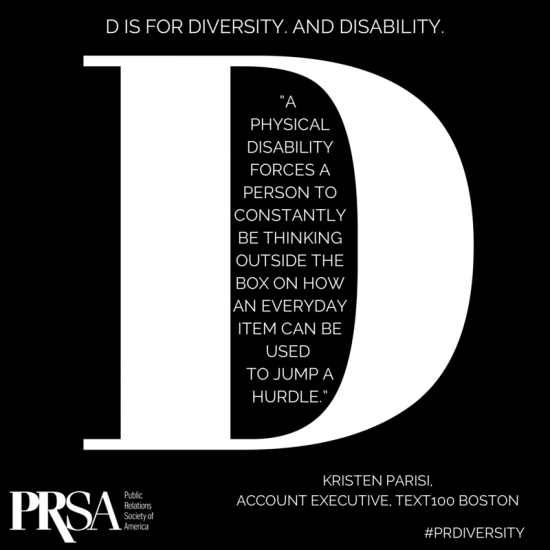 I’m so glad that the PRSA is highlighting people with disabilities as a community to be acknowledged!